Good News! WSOP.com is available to US players (Restricted in the following states: All States except Nevada, New Jersey). Licensed in Nevada and New Jersey. Action at many different games. WSOP.com is available to US players but restricted in the following states: All States except Nevada, New Jersey. WSOP.com operates two poker sites in the United States. One is in New Jersey. The other is in Nevada. Each respective state licenses them. The two sites do not share player pools with each other. The Delaware Lottery poker sites network with Nevada. WSOP.com New Jersey pools players with 888 and is intrastate. WSOP.com offers Texas Hold’em, Omaha, Omaha High/Low, Seven Card Stud and Seven Card Stud High/Low. Deposit options include cash at related casinos, electronic check, Visa, Mastercard, Neteller and PayPal. Players may withdraw by cash at related casinos, check, electronic check, Neteller and PayPal. Caesars Interactive, a subsidiary of Caesars Entertainment, owns the World Series of Poker. The online poker room bases its success off of the live tournament series held at the Rio in Las Vegas every year. It became the second regulated online poker room in Nevada in September 2013. WSOP uses software powered by 888, which is the third largest online poker network in the world. WSOP players do not have access to the international player pool. WSOP is available to players in Nevada and New Jersey. The sites do not share player pools. Each has its own ring-fenced action. WSOP is the largest Nevada online poker site. It holds second place in New Jersey. Delaware and Nevada started sharing player pools in March 2015. 888 powers the Delaware site, but uses the same software as WSOP.com in Nevada. State gaming commissions license and regulate WSOP.com. Players can deposit and withdraw cash. Or they can transfer money between the site and their bank account. WSOP.com offers Omaha and Seven Card Stud games. The traffic at WSOP.com is poor. The Nevada and New Jersey sites are not networked. There are some issues with the software and geolocation. The verification process to withdraw to a bank account is a pain. Internet accounts without paper checks are not acceptable. Player support and site management are among the worst in the history of the online poker industry. “I was sitting in the Caesar’s Las Vegas poker room using their wifi. I loaded the WSOP mobile app on my tablet. The software could not geo-locate me. No one in the Caesar’s poker room could help (all of the poker tables say “Log onto WSOP.com!”. I called their customer service. No help. WSOP.com offers several deposit and withdrawal options. This includes credit cards, debit cards, bank transfer, cash and ewallets. WSOP.com accepts cash at company owned casinos in Las Vegas, bank transfer, Visa, Mastercard, PayPal, Neteller and PayNearMe. Cash deposits may be made at Caesars Palace, Rio, Paris, Planet Hollywood and Harrah’s. Players may withdraw by cash, bank transfer, check, Neteller or PayPal. Cash may be picked up at Caesars Palace, Rio, Paris, Planet Hollywood and Harrah’s. Neteller and PayPal can only be used if funds were deposited using this method. Other Processors: Cash deposits at approved casinos. 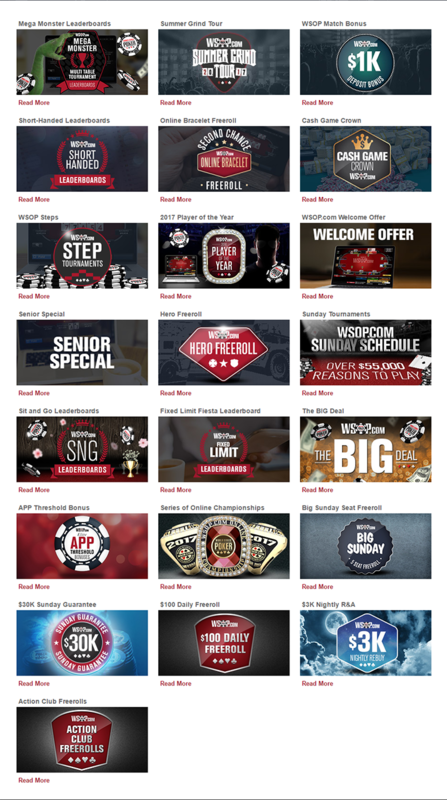 WSOP.com offers many different poker bonuses. Players can choose which one they prefer. They ahve seasonal and constant bonuses that you can take advantage of. New WSOP.com players receive a 100% up to $400 first deposit bonus. The bonus clears at a rate of $10 for every $50 in rake paid. Players have 60 days to clear the bonus before it expires. New players, as well as loyal players, can take advantage of this special event. When you make a deposit, you can earn 100% up to $1,000 on your very first deposit, if you are new, using the bonus code WSOP2017. Loyal players can also take advatange of this bonus when they reload their account. Players looking to get up to $1,000 on a reload need to use the bonus code WSOP2017R. This bonus is seasonal, so be sure to look at the terms and conditions on their website. For players looking for promotions, WSOP.com has many to offer. They have freerolls, tournaments, cash bonuses, and much more. Make sure to check the terms and conditions of any promotion you want to use. There may be more than one promotion with the same perks, but will have different terms, rollover, and other details. Below are a few of their more outstanding promotions players can take advatange of. Action Club is WSOP’s VIP program. Players must generate $100 or more in contributed rake to qualify. Monthly returns range between 4% and 20% for monthly tiers. There are two annual tiers that return up to 30%. WSOP.com offers a new leaderboard every month. Some are based on fixed limit points. Others are paid according to winning sit and gos and multi table tournaments. Players may choose between Texas Hold’em, Omaha, Omaha 8 or Better, Seven Card Stud, and Seven Card Stud High/Low. Players may sit at up to six tables at one time. This is also the maximum number of tables allowed on the 888 Network. Texas Hold’em games spread in six-max and full ring. All Seven Card Stud and Seven Card Stud Hi/Low tables have eight seats. Ultimate Poker launched a stripped down online poker client with virtually no features in April 2013. WSOP.com took a different approach. Its software is full of modern features that online poker players have come to expect over the years. Players must be located within Nevada or New Jersey at the time of play. WSOP combines IP verification with cell phone triangulation to determine whether a player is in Nevada at the time of login. Players outside these two states may view the lobby but not real money tables. Visitors to the convention center at Rio were inundated with advertising from WSOP.com during the Summer 2013 event. Players could sign up for WSOP.com at multiple booths. This feature returned in 2014 and 2015. The 2015 World Series of Poker had an online bracelet event. WSOP.com players have a Mac client available. It offers all of the same features available on the Windows platform. WSOP.com accidentally launched the Mac client for real money on May 30, 2013. Some players were able to make a deposit by credit and play. This issue was quickly discovered by employees and the Mac client was taken offline. Has There Ever Been a Scandal at WSOP.com? WSOP.com has not been involved in any scandals. What states does WSOP.com accept? WSOP.com is available to players in Nevada and New Jersey. Do Delaware online poker players connect to WSOP.com? The Delaware Lottery sites pool with WSOP.com Nevada. Are the New Jersey and Nevada WSOP.com sites connected? No. The two WSOP.com sites have separate player pools. The first deposit bonus is 100% up to $400. Does WSOP.com offer reload bonuses? Yes. There is generally one reload bonus each month. Are there World Series of Poker bracelet events at WSOP.com? Yes. 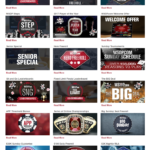 There are three bracelet events spread on the WSOP.com Nevada site.